We have very seasoned roof cleaners who can easily bring your roof back to spotless condition in no time. They work with highly effective pressure washing equipment and also telescopic poles which could remove mildew, lichen,algae, icky stains and moss from any roof. This will help make your property look much better, and will keep it protected from damage from all the potentially damaging clumps on it. You could save lot of money for repairs, by scheduling our service. We will ensure that your roofing is nice and cleaned up and we can do it at a very reasonable price. If you need help with the cleaning of your gutters, your roof or your outdoors windows, do not hesitate to book our first quality cleaning services today! Gutter cleaning must be done at least once a year, so that you avoid clogging of your gutters and downpipes and water damage to your property. Ashlee House Cleaning has highly experienced, vetted and friendly gutter cleaners who can efficiently clean out any dirt, leaves, twigs and other rubbish. They will ensure that you get your gutters clean by using telescopic pipes with cameras, connected to powerful water or dry vacuum cleaner. You will see photos of the condition of your gutters and downpipes. This service is provided with a 30 days quality guarantee, and we will return to re-clean if they get clogged during that time. Ourwindow cleaning service is deep cleaning of windows, using purified water and fed pole cleaning method for external window cleaning and squeegee for internal window cleaning. 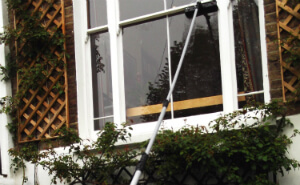 Our deep and thorough Latchmere SW18 domestic window cleaning service involves not only secured window cleaning, but also cleaning of almost all frames, if PVC, wiping of all sills, if reachable, also. We guarantee fast result and insurance in case of any omission. Key pick-up and shipping can be arranged, if you have no chance to remain in the property or home throughout the process. Almost all sort of domestic properties are accepted. Order top-quality window cleaning in Latchmere SW18 right away! To try to make the booking method as fast and easy as possible, we have integrated a fantastic 24/7 system. You just need to make contact with us by either dialling 020 3746 1366 or making use of our online contact form. You can request a absolutely free quote or directly book our window cleaning Latchmere SW18 service right now. Our expert window cleaners can arrive on virtually any day of the year. We have bank holiday and weekend availability. We have good prices, no hidden fees, and no upfront payment for booking. We will offer you a price cut for each other service you order along with the window cleaning. Landlords and real estate agencies get lower rates as well. Take advantage of our environmentally friendly, professional and cost-effective cleaning services and make a reservation today. You will get an e-mail confirmation within the next 2 hours!